Do you ever want to workout but also need to relax?? It seems like an oxymoron but it really isn't!! 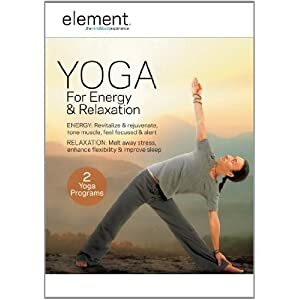 You can get both and I have discovered the perfect DVD for both relaxing and pushing your body: Yoga For Energy and Relaxation! Best of all, it has TWO different Yoga Programs included so you can do whichever you feel you need at the moment: Relaxing or Energy! Filmed in a beautiful garden overlooking the Pacific Ocean, these two yoga sessions are designed to give you a perfect balance of vitality and calm. The Energy program revitalizes and builds stamina with postures that are known to boost the nervous system, build strength and tone muscle. This invigorating sequence will reduce fatigue, improve productivity and leave you feeling focused and alert. The Relaxation program melts away tension in your muscles and your mind with a combination of soothing restorative asanas, deep relaxation techniques, flexibility enhancing postures and poses known to calm the natural fight or flight mechanism in the body. This peaceful sequence will help you gain flexibility, improve sleep and dissolve away stress leaving you with an overall feeling of wellness and contentment. Nice.! Its good to learn relaxation techniques. I have an Mobile apps that helps me. check it out.